The Springer Spaniel, or English Springer Spaniel, as it is also known, originated in England. This medium sized dog was produced as a companion gun dog. The word Springer comes from that hunting roll where the dog would literally spring or flush birds into the air for the hunter. This breed has two different types, depending on the use, its the same breed but stock has slight difference for the applications. The show version of this breed has a much longer coat including on ears and legs, plus they tend to be thicker boned and are striking examples of this breed type and symmetry. The field version of this breed is slightly more slender and their coat does not grow out as long and the ultimate in athleticism and performance. But no matter what the use, the coat comes in two colors; black or liver with predominately white markings. Springers have lived in the White House two times both in the Bush families. The average life span of this breed is 12 to 14 years old. The AKC recognized this breed in the Sporting Group in 1910. Average size for the Springer Spaniel should be 19 to 20 inches tall at the withers with a weight of 40 to 50 pounds. 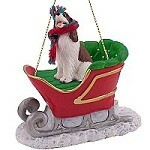 This ornament is a little red sleigh with green interior, gray runners on top of a pile of snow. Each one has a gold tone cord for handing this unique collectible decoration on your Christmas tree, or displaying it anywhere. The base measures 3 ÃƒÃ‚Â½ X 1 ÃƒÃ‚Â¾ with felt covered bottom. The green interior has tiny gold buttons to match the gold trim on the outside of the sleigh. The empty sleigh stands about 2 ÃƒÃ‚Â¼ tall, and the figurine would rise above that. The picture perfect decoration for the entire winter season! Over the river and thru the woods.. pops into mind.